Information radiators are a great way for you to communicate information to a team that they just are not seeing for themselves. It also helps you to not have to nag the team with information they aren’t ready to hear about things they are doing that self-sabotaging. I created this radiator when I was working with a team that had gone through several sprints where they kept voicing that they were going to finish all the work until the last day when they finally admitted that they were not going to finish. I’m not sure if they were deceiving themselves or if they were afraid to admit failure but either way there were several reasons why I could see early in the sprint that they were not going to complete the work, but they couldn’t accept fate until the last day of the sprint. By then, there wasn’t much that could be done to change directions or not frustrate stakeholders with surprise unfinished work. The radiator I used is pretty simple. I wrote and labeled a line for each day of the sprint across a piece of flip chart paper. (This could be easily done on a white board.) Then I wrote the numbers 1-10 evenly across the lines. I then divided the lines into 3 parts and highlighted one part red, yellow in the middle, and green on the right. Across the bottom I wrote, “How confident are we that we will meet our sprint commitment at 80% or higher?” I selected 80% because the company had a 80% metric that they expected teams on average to complete 80% of the work each sprint. You should label this however seems appropriate to your organization. I introduced the information radiator to the team and explained that I had noticed that we seem to be confident that we will finish the work until the last day but we were ending up with lots of unfinished work each sprint. I asked them if it would be okay if I just did a check in with them once a day during the sprint to see how they felt about their ability to complete the work they selected. 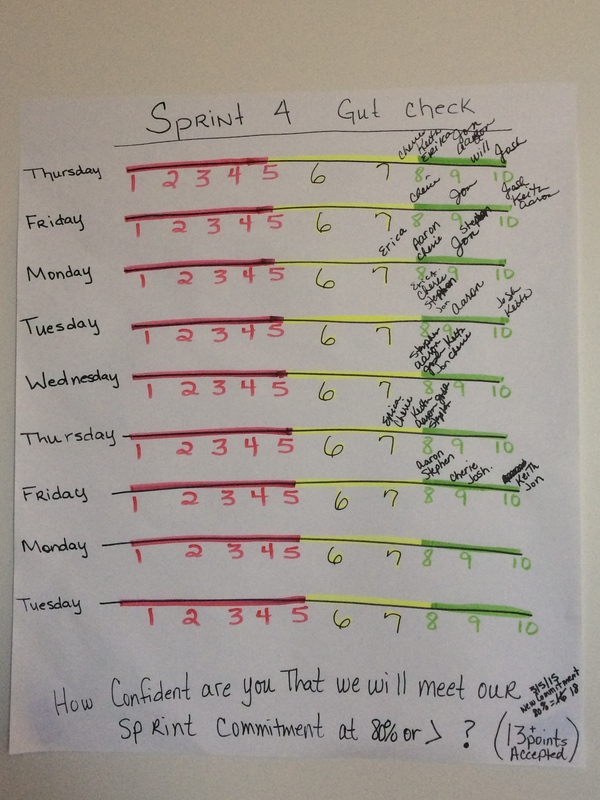 So, every day at around 3pm I would ask the team for their gut check, which was their personal confidence level on a scale of 1-10 that we would finish the work in the sprint. If they were all in green then all was well. If they were in yellow or red the team would regroup and figure out what changes they needed to make in the way they were working and would also decide if any communication needed to go out to stakeholders for work in jeopardy. On the 5th day of the sprint something amazing happened. One of the developers stood up at about 2:30pm and declared to the team. “Look everyone, in about 30 minutes she is going to ask us about our gut check and I can’t honestly answer because I have no idea where we are. Testing tasks are just sitting there and I have no idea what’s happening!” Then, the team FINALLY had a heated discussion about the fact that testing tasks were not broken down into individual tasks and no one had any idea what was being tested and how testing was progressing on each story. At the end of their heated debate they decided that they would no longer write tasks like “implement” or “test.” Instead, they agreed to write their tasks more specifically like, “write test cases,” “write automated test,” “regression test,” and similar for development tasks. I was so proud of this team! I knew that this was the problem and had tried to get the team to break down their tasks and to push on the tester to explain where they were on the work each day since his 3 hour testing tasks were lasting 3-4 days. However, until they could see it with their own eyes they weren’t ready to accept that a change needed to be made. They also needed to get to a place where they were ready to have some healthy conflict instead of just “being nice” all the time. After this incident the team was better about being open and questioning why work was not getting completed to identify if there were impediments or additional assistance needed. Another side effect of using this radiator was that someone wanted to know why the team was shooting for 80% as a goal. The team discussed this and decided that even though 80% was acceptable for the company they should strive to always get 95-100% of the work completed each sprint. They also decided that if they got 100% for 3-4 sprints they would raise the bar and take in more work to try to increase their velocity. Remember, this information radiator is not intended to be a whipping stick. When I asked about their gut check I just indicated where people were. You can write a dot or an x or whatever other type of indication is right for your team. I wrote their names. You could even leave off the numbers and have the team just write an X on the line where they are. The colors are important so don’t leave those off. I didn’t use this radiator with the team for very long. I think I used it for two sprints. It had done the work I needed it to do so I stopped when it was no longer valuable. If you decide to use this radiator, please let me know about your experience and send me a picture!